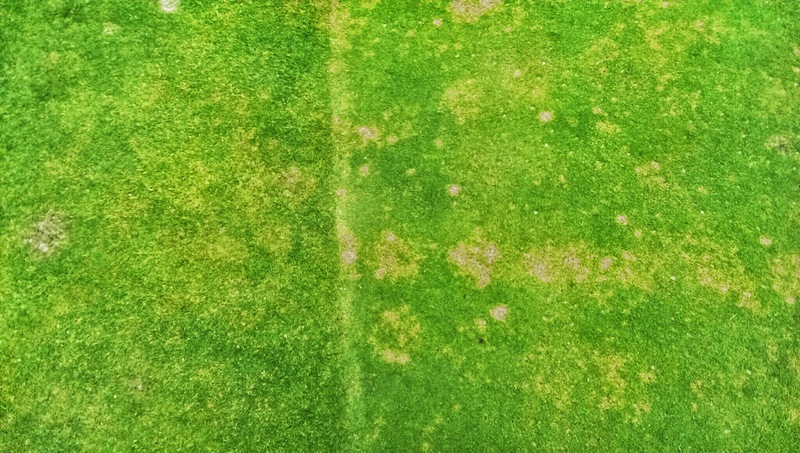 Turf Hacker: How to turn 1 spot of fusarium into 1000. How to turn 1 spot of fusarium into 1000. Step 1: Do not apply a preventative fungicide prior to verticutting greens despite there being a small amount of active fusarium present. Step 2: Verticut greens in 2 directions. 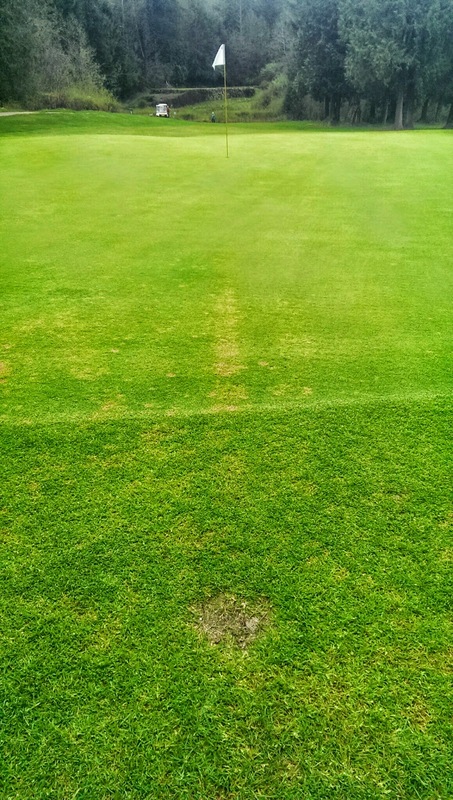 Be sure to start on the always untreated collars to drag the innoculum onto the greens. Step 3: Do not spot spray any new infection sites for the next 2 weeks. Step 3: Irrigate with cool spring freshet water during an early season dry spell. Step 4: Continue to mow with dull "rockbuster" reels almost daily for 1 week to spread the disease even further. On Tuesday, April 22nd I put out the first broadcast traditional fungicide spray in almost 4 months! in that time I had used nothing but phosphite and careful spot spraying to keep the greens almost 100% clean of any disease. Spot spraying was going so good right up until it went bad! I expected spot spraying to eventually not work but for completely different reasons. I initially thought that the natural incidence of disease would be the factor that I would have to contend with but it turns out that my actions directly lead to the phenomenal display of fusarium patch on my greens at the moment! In failure I have opened up a huge learning opportunity but it took me a few weeks to figure out just what went wrong. As a quick aside I think that allowing failure is the best way to really go forward. I know it's not tolerated by most but if you do have a failure treat is as a learning experience, then share it with others so they can learn too. The above 4 step program is what I now think is the reason the disease is so bad on my putting greens at the moment. Here it is again with a bit more detail, in story form. On the Monday (day before aerating) I was not able to spot spray the few incidence of disease on the greens. 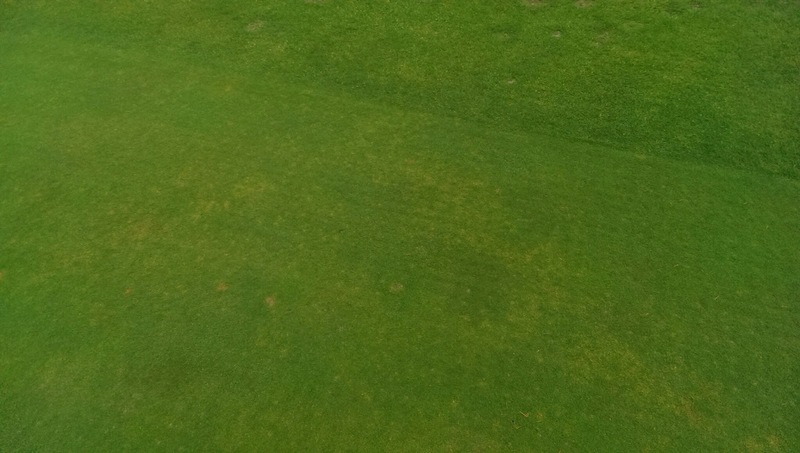 Prior to aeration the incidence of new fusarium spots was about 2 spots/100m2 per day. I had noticed that there was quite a bit more disease on the first green so I broadcast sprayed it with iprodione. Fast forward to today and this green is one of the worst for disease, despite the fact that it was the only one that received a broadcast spray. This suggests to me that maybe the cause of this disease outbreak happened post aeration. I am thinking as far as 2 weeks after. Aeration this spring consisted of a 0.5" core followed by a roll, topdress, drag and 2x verticut. The week following aeration the disease rate actually went down to 1 spot/100m2 per day. The weather was perfect, dry and almost warm. Two weeks following aeration it was apparent that it was actually too dry. Recovery was starting to be hindered and VMC readings showed average soil moiture well below 20% with a few 4% readings! I fired the system up and irrigated the greens to bring the VMC up to 25% to aid in aeration recovery. As if I flicked a switch the disease pressure exploded! Initially I thought it might be due to the stagnant irrigation water containing harmful fungi but it was suggested that it was most likely the temperature of the irrigation water that was to blame. 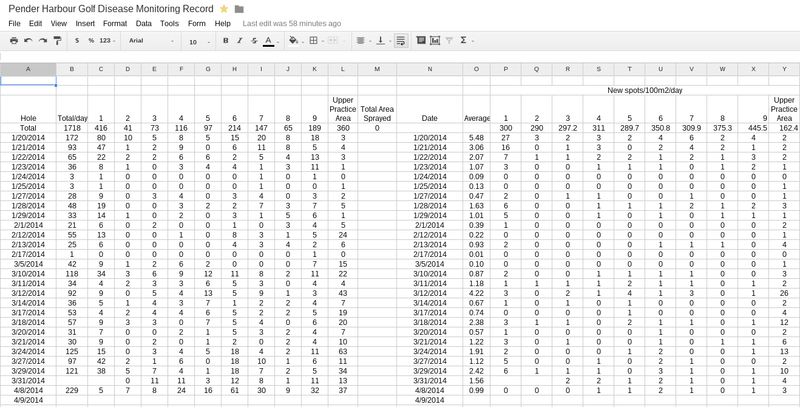 After a week of thinking, observing, and a complete abandonment of spot spraying I was able to figure it out. The verticutting spread the innoculum from the aprons onto the greens, sure some disease naturally occurred but the majority of what I was seeing was spread by us. This becomes quite apparent due to the patterns of disease seen in the first few photos in this post. Here's another one, disease occurring at right angle pattern, the same pattern used to verticut the greens. It is very obvious that this was spread via machine, not nature. The disease wasn't able to infect during the period of dry weather following aeration and it wasn't until I introduced moisture that it really took off. The fact that this water was quite cold probably also didn't help things much. 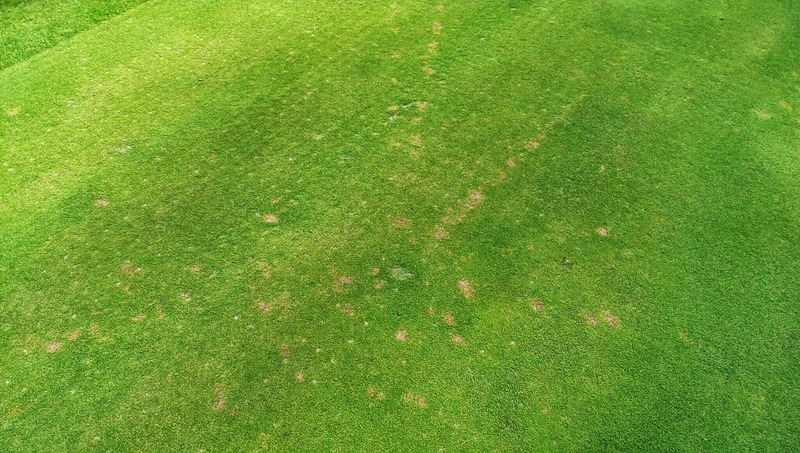 The initial spread via verticutters was made worse by subsequent mows without spot treatment. Failure and in spectacular fashion I must say! The really cool thing about this failure is that it really teaches me a lot of things. I was correct that the majority of fusarium infection on my greens wasn't actually naturally occurring. It was placed there by maintenance staff. My spot spray record don't show that spot spraying works but show the incidence of disease in an incredibly detailed way. 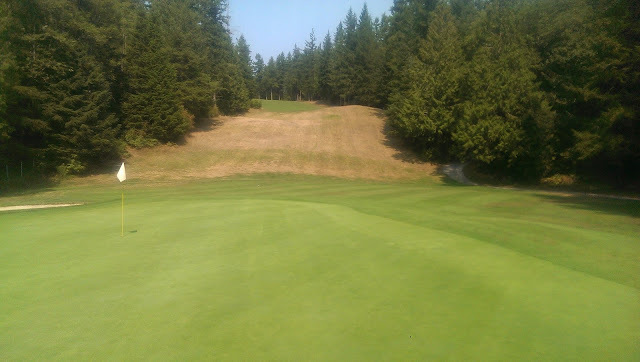 The careful records showed me the actual incidence of disease as each time of recording all visual incidences of fusarium were treated with a spot spray consisting of iprodione, chlrorthalonil, and civitas. What I have really learned is the true impact that our daily maintenance practices have on disease. It is quite clear to me that anything that can be done to reduce the need for mowing and verticutting will help reduce the incidence of fusarium on putting greens. 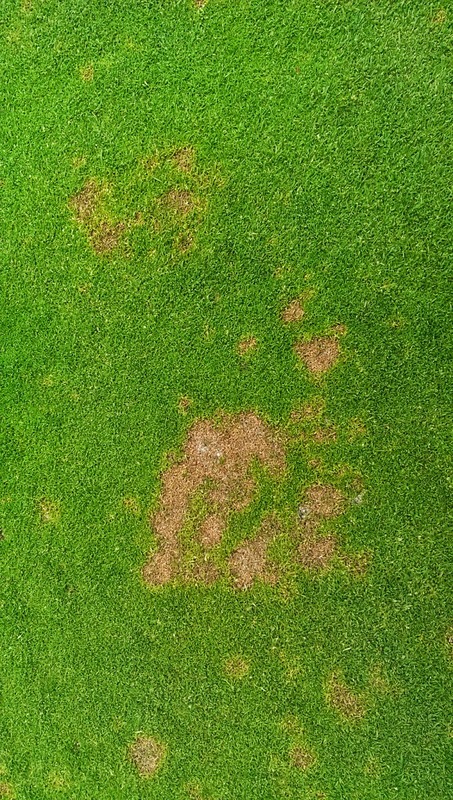 This could have perhaps the biggest impact on disease on putting greens out of any practice that you employ to reduce the need for pesticides. This might be why rolling is gaining so much favor across the world as a sustainable maintenance practice. You can start rolling tomorrow and effectively cut the spread of disease in half. Does this equate to half the pesticides? Not really because following an application the greens are essentially immune to disease until the effects of the pesticide wear off. It might, however, get you an extra few days or a week of tolerance before your next pesticide application disease threshold is reached. This might also be why the growth potential fertility has shown a reduction in disease pressure. By matching fertilizer applications to the natural growth rate pattern we don't have to cut as much during periods of high disease pressure. I feel that not enough focus has been put towards looking at ways to prevent disease spread. I think a lot can be done with cutting unit roller selection and other possible impacts on disease spread. Going forward I plan to resume spot spraying as soon as this current learning experience recovers. I have no clue if it will still work especially now that we are into the mowing season. I plan to resume Primo applications shortly as well. What do you think? I would love to hear your opinion on this!